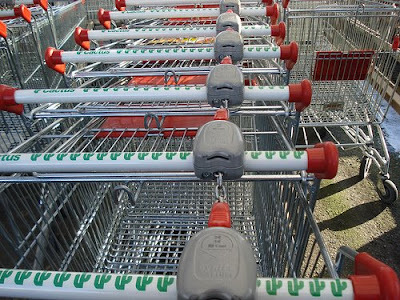 Here in Lux the grocery carts are chained together. In order to get one to use you must insert 50 cents to free the cart. When you are finished with the cart, return it to the cart stall, insert a "key" from the cart infront of yours and your 50 cents pops out. This seems to be consistent at all grocery stores although one requires a 1 euro deposit. Needless to say grocery carts are never left strewn all over the parking lot. I keep a coin in my coat pocket and one in my car. 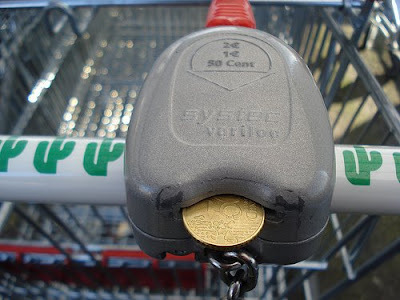 One grocery store gave me a cart token to use in place of a 50 cent coin. Hand held baskets are available without a deposit. One more interesting note about grocery carts ~ If you're grocery shopping in a store that is located in a mall, it is perfectly common and acceptable to wheel your cart throughout the mall and into other stores. Picture shopping at Old Navy with a grocery cart full of your bags of groceries. We have these carts at our grocery store in PA. I think they are a great idea. The carts are done the same way here in The Netherlands too! I wish Texas (where I'm from) would start using them, because I'm a cart-returner & it seems that many, many people are not! It's genius!! We have them here in NC, but only at one grocery store...Aldi, which originated in Europe. Go figure!! 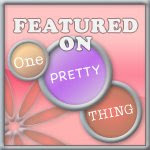 :) I think everyone should start using them! I'm glad you are enjoying your time over there!! Everything you post reminds me of Germany. My parents lived there for 6 yrs and I spent a lot of time there during the summer and at Christmas time. I'm enjoying these posts very much. Keep 'em coming. Some stores in Canada have them too, not all though. This is cool! I used to work at a grocery store and this would have been so nice. One gets tired of chasing grocery carts across the parking lot and even across the road! Great series on the 'little differences'. I am sure you will continue to find them all the while you're in Luxembourg and traveling around. I know I still find myself say, 'Ahhhh, that's different' even after 2 1/2 years in southern Italy. I WISH they would do that in the US! I hate having to navigate a parking lot always on the look out for loose carriages! My husband is from Ireland, I can remember the first time I went to the store and I discovered all the carts locked together, I could not belive it - I never carry cash so I had to go to an ATM, get money, break the bill - UGH!!! All for one stinkin' cart! Our Walmart (TX) used to have those cart devices. It was only a quarter though. I guess people complained about the inconvenience because it didn't last long. I liked it. Much better than to come out of the store to find a cart rammed into the side of the car.